Lost to the Sands of Time? This week: This time, I think about the problems that occur when trying to play older computer games. It is Eastern and hence a very good opportunity to take a few days off and visit my parents. Staying in my old room, I can see my collection of computer games I bought and played as a teenager. Looking through the titles brings back some great memories and the desire to play some of them again: Commandos, Unreal Tournament, Command and Conquer Red Alert, Tomb Raider, The Settlers 2, Half-Life, etc. Playing the games of the Commandos series was a fantastic time. The strategy games challenged a player with the goal to complete difficult missions with only a handful soldiers of which each had unique abilities. In this way, players had to combine those abilities to silently move through the maps and complete the objectives, e.g., destroying a dam or taking out a dangerous sniper. Thus far, the tactical real-time strategy gameplay of Commandos is unmatched. However, since these good old days, new technologies were developed, computers became more powerful and new operating systems got released. As a result, it is not easy or sometimes even impossible to get older games running, again. When aborting to try to get such an old game running again, I often feel sad as it seems that I will never ever play it again despite still having access to the software itself. Similar to books and movies, computer games have become an integral part of our culture. Some of these games, especially those that represent an important milestone in the history of gaming, need to be preserved and made available to future generations. This, however, also comes with the requirement to either preserve the technology on which the games are running or to develop a framework that can emulate specific systems on modern computers. In conclusion, computer games are a part of our culture. Older games need to be kept running to preserve important milestones for future generations. Otherwise, they might be never experienced again and thus be lost to the sands of time. This week: This time, I think about how computer games could initiate a rethinking process that ultimately makes the world to a better place. Recently, as I was evaluating my lunch options, I saw the following offer at a small bistro: „Chicken wings and fries – €2.50“. Although this might sound like a great lunch opportunity, it seemed not very appealing to me. How can food be this cheap and still be healthy? The poor chickens must have lived under terrible conditions to be finally sold for such a low price. Unfortunately, this is just the tip of the iceberg. Our culture enjoys a lot of meat-based meals which currently are offered at a very low price. This generates a huge demand for meat. To fulfill this demand and to keep the price low, meat has to be mass-produced. As a result of this, the way to handle the animals needs to be as efficient as possible. Their food needs to be cheap and their living space needs to be as small as possible to fit the highest number of animals into a particular area. Fulfilling these conditions comes at the price of the animals‘ quality of life. They need to be vaccinated to reduce the chances of deseases and be kept under control so that they do not attack each other. Overall, this results in the animals living under terrible conditions to fulfill the high demand for cheap and meat-based food. These problems, however, are often overlooked by the consumers. The only important thing is the price when it comes to selecting a product. Therefore, to start initiating a change of this process, it is important to raise the general awareness for these problems. Computer games could be one approach to achieve this goal. Computer games could demonstrate the conditions under which the animals live by putting the player into the role of such an animal. This, however, would not really help to initiate a rethinking, as it provides not enough information about the decisions involved in the food production process. A potentially more effective way would be to involve the player in the complexity of the food industry by designing a tycoon-like computer game. This game needs to evolve around the goal to effectively and efficiently lead a food company. While the player’s main goal should still be to achieve commercial success, other factors such as the happiness of the animals as well as the quality of the produced products have to play an important role. If designed well, this kind of computer game can inform players about the complexity of the food production as well as the side effects of mostly aiming for cheap products. In conclusion, while computer games might not address the majority of the consumers, they still can start to initiate a rethinking. Players of these computer games might get convinced that they can put pressure on the food industry by selecting different products. Also, they can discuss the lessons learned with others and convince them as well. This week: This time, I think about computer games I will remember for a very long time and those I will not. When I think back to my computer game playing experience, then a few titles always will pop up in my mind first. For instance, I will always remember having played the Mass Effect series, Kerbal Space Program, and Assetto Corsa. But why are more memorable than games like Company of Heroes or Transport Fever which also kept me entertained while playing them? The reason for their memorability lies in their game design that either resulted in a highly emotional gameplay or in a gameplay that allowed for a fair competition between players. Emotions are always real to us no matter if they are evoked by a real or by a virtual event. Emotions are also very deep experiences that are easily memorized and triggered when thinking back to a particular event. The Mass Effect series puts the player into the role of a spaceship’s commander. During the gameplay, the game’s narrative challenges the player with the task to protect an entire galaxy from an enemy that intends to wipe out all living species. The player, however, is not alone but has virtual companions. Each of these crew member has an own personality and, depending on the players decisions during the gameplay, has a different fate. For instance, the player can have a love affair with members of the crew and sometimes even is responsible for deciding which of the crew members has to sacrifice its own life to protect the rest of the crew. In this way, the player creates strong emotional bonds to the virtual agents that start to feel real as the gameplay progresses. These emotions are what make Mass Effect to a very memorable computer game. In contrast, Kerbal Space Program features no emotional narrative. However, the game’s difficulty is relatively high. The game mechanics encode knowledge about orbital mechanics that has to be understood by the players to successfully play the game. This not only results in a very steep learning curve, but also in very exciting moments when the player achieves a personal goal, e.g., landing on the Mun, and realizes that they have acquired new knowledge in this process. This challenge-based rewarding moment also evokes strong emotions in the player which subsequently result in the game being memorized as a very positive experience. Thinking back to playing Kerbal Space Program then triggers these emotions again, thus making this game to a very special game in a player’s history. Allowing for a fair competition ultimately results in a very emotional gameplay as well. Assetto Corsa is a highly realistic racing game that provides players with the opportunity to perform virtual car races that put their own driving skills to a test. For instance, players can race against each other driving the same type of car which then results in no driver having an advantage due to balancing issues. This kind of gameplay induces a (friendly) competition among the players, especially when they participate in championships and compete over a longer period of time against each other. This competition, the challenge to practice and to train the own skills, and to ultimately celebrate small victories evokes positive (and sometimes also negative) emotions in the players. Thinking back to playing Assetto Corsa triggers these emotions again which also make this type of game to a very special memory. In contrast to these games, other games merely provide some entertainment during their actual gameplay. They might even motivate a player to continue playing the game to collect all possible achievements, but at the end of the day, only light emotions were triggered during the gameplay. As a result, no or only weak emotional bonds are created to these games which make them seem less memorable when thinking about great games that truly influenced us. In conclusion, while almost all computer games entertain a player, only those are truly perceived as great computer games that evoke strong emotions in the player during the gameplay. This also is an important insight for game designers who like to create serious games or to increase the motivation using a gamification approach. Creating a gameplay that evokes strong emotions potentially achieves the best results. Personally, I am a huge fan of computer games that put a strong focus on the exploration of the virtual environments. The exploration aspect can be categorized in three main types: 1) a travel-based exploration, 2) a challenge-based exploration or a 3) resource-based exploration. Depending on the type, the exploration has a different role in the overall gameplay. A travel-based exploration requires a fully explorable vast virtual environment that consists of several special features, such as waterfalls, spectacular vantage points, or hidden ruins inside of deep forests. These special features can be discovered by traveling through the environment. Here, the exploration either is the core element of the gameplay, e.g., when playing a walking simulator, or an optional aspect of the overall gameplay, e.g., when playing an open world role-playing game. A challenge-based exploration lays a higher focus on the exploration of the virtual environment during the gameplay. In contrast to a mere travel-based exploration, this type requires the player to find a way to overcome obstacles. For instance, when playing Kerbal Space Program, a player has to design spacecraft that have the correct performance when aiming at the exploration of specific celestial bodies. The spacecraft not only has to reach the celestial body, but also to be powerful enough to deal with the environment, e.g., a strong gravity. In this way, a challenge-based exploration provides players with concrete goals for exploration that determine the overall gameplay. Finally, a resource-based exploration allows a player to refine resources during the gameplay to craft more powerful items. This requires a player to find these resources first. In this way, the gameplay challenges a player to explore the virtual environment to find and to obtain all the basic resources. This often bases on the requirement to explore all regions and zones of the virtual environment. For instance, when playing Minecraft, a player needs to dig down to the so-called bedrock layer to find diamonds which are one of the most valuable resources in the game. The three types can also be combined to provide different forms of exploration at the same time. Once having landed on the surface of a celestial body in Kerbal Space Program, a player can travel on the surface with the astronauts either on foot or using vehicles that have to be landed there first. While travel-based exploration and challenge-based exploration follow simple rules, a resource-based exploration can be difficult to design. Here, players need to be made aware of the existence of all resources to initiate the exploration process. Also, players need to be informed how and where a certain resource can be found. Otherwise, a player might either miss some crafting recipes or experience frustration when feeling stuck during the exploration. For instance, as I was searching for a specific resource on the home planet in the full release version of Astroneer, I felt stuck because I was not able to find it. Also, the game did not provide me with information that the resource could not be found on the home planet. 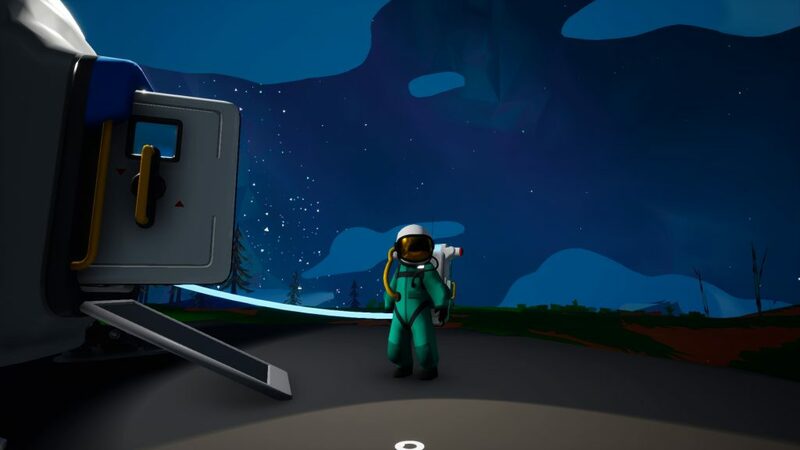 In this way, I spend a long time digging deeper and deeper into the planet until I finally decided to abort this approach to try out to fly to a different planet in the virtual environment of Astroneer. As soon as I launched into space, the game provided me with a map of all the existing planets and informed me about the resources that can be found on them. Thus, to avoid this kind of frustration, it is important to provide players with hints or game mechanics to find out where specific resources can be found when implementing the resource-based exploration. In conclusion, a computer game can provide three main types of exploration. Depending on the type, some additional information are required to avoid evoking a frustration in the player. The exploration types may be combined in the same computer game. This week: This time, I think about the ideas of being used to read instructions more closely when being a vested computer game player. Most computer games provide players with specific goals and challenges. The goals are communicated in a clear and precise way. Hence, players exactly know what they have to do to overcome a challenge or to solve a quest. While working on the solution of the game goals, computer games provide immediate feedback to inform players that they are performing the correct actions. For instance, a computer game can provide a quest that requires the player to collect 10 red apples: „Collect 10 red apples in Mrs Smith’s garden.“ In this way, players exactly know how they can complete this quest. A player still has to read the quest information carefully as the apples not only have to be red, but also found on Mrs Smith’s garden. Thus, by providing players with these clear rules, they practice to read instructions carefully. Also, they learn how to quickly understand an assignment’s goals. The gameplay can include some time constraints that put the player under pressure to make decisions quickly. This constraint makes it important to analyze a task as quickly as possible. Carefully reading instructions also is a common requirement in our daily life. For instance, it can be an assignment from an educational course or a request sent by someone’s supervisor. Only when the instructions are understood properly, the task can successfully be solved. Just skimming through the information might result in a task not completely solved. This can result in bad consequences like getting a bad grade in an exam. Based on this theoretical analysis, it might be possible that computer game players can analyze and understand tasks better than non-players. Their gameplay experience might lead to a training of their analytical abilities to quickly and correctly understand a given task. In this way, computer game players might be able to work more efficiently. In conclusion, playing computer games might also result in an improved ability to analyze any given situation as well as to successfully identify and to carry out the correct next steps. This week: This time, I think about the enjoyment of playing early access games. More than two years ago, I played Astroneer just after its release as an early access game. Astroneer puts the player into the role of a little astronaut who lands on the surface of a planet. There, the player is challenged to set up a base, perform research and finally construct spacecraft to visit other planets in the solar system. The game is an open world game and allows players to discover the virtual environment at their own pace. Although not being polished, the game already was a lot of fun to play. One of the most fun elements of playing early access games is to discover small bugs and glitches that break some parts of the game. Experiencing some visual glitches often results in some hilarious moments that cause an additional level of joy during the gameplay. For instance, I remember that the planets one could see in the sky were falling apart at some point. Suddenly, the planets were split into smaller pieces that started to drift apart, thus revealing a planet’s inner structure. After having explored every planet in Astroneer’s solar system, I had the option to either continue playing the game to experience freshly added features or to stop playing it for a while to not get bored of it. I decided to stop playing the game and to wait for the release of its final version. In this way, I kept the game in good memory and avoided to go through the usual repetitive gameplay of early access games. Typically, after the implementation of some major gameplay changes, a player often has to restart an ongoing game, thus going through the early stages of a game over and over again. While this can be fun when the changes affect the early game, it mostly becomes repetitive and annoying. As a result, players tend to „burn out“ on these games. Now, two years later, Astroneer finally is released and so I returned to it. After this long break, the game feels almost like a new game as some game mechanics, e.g., researching new technologies, were changed completely and the graphics look way more polished and colorful. In this way, I can now enjoy Astroneer for a second time and basically play a different game. In conclusion, playing early access games can be a lot of fun especially when glitches are accepted and more importantly enjoyed. However, due to the ongoing development process, players might burn out on the game when they have to start a new game for too many times. Thus, by only revisiting the game from time to time, the enjoyment can be preserved and the changes can be more appreciated. This week: This time, I think about the problems of simulating physically energetic moments in computer games. Recently, as I was exercising on a running machine, I experienced an interesting phenomenon of actually feeling my own performance. Normally, one can experience a feeling of satisfaction when a new level of performance is reached, e.g., achieving a new record time. This time, however, I was not only experiencing a new level of performance, but also noticing how I was affecting the environment. In particular, I noticed how the running machine was slightly shaking as I was running on it at a fast pace. It was like a super energetic moment to me. This reminded me of a visualization style for delivering particularly strong blows during the gameplay of action games. Here, game designers let the view of the player shake for a short amount of time. This suggests that the player’s attack affected the entire virtual environment. When this frequently occurs during the gameplay, players might perceive the game as highly energetic. However, in contrast to my running experience, the gameplay only provides visual feedback and lacks a directly physical involvement of the player in the actions. Naturally, due to the game immersion, players perceive it as a real event, but the actions remain artificial. In this way, the gameplay lacks a whole-body involvement which might result in an overall improved experience. This would be different when targeting immersive Virtual Reality. By using tracked game controllers and a tracked Head-Mounted Display, a player’s physical action can easier be used to trigger actions inside of the virtual environments. Unfortunately, fitting haptic feedback is not yet possible. As a result, game designers would need to stick to visual cues. These cues need to be carefully implemented to avoid evoking cybersickness in the player. Computer games consist of several game mechanics. Game mechanics represent a game’s rules as they encode the underlying principles and overall game knowledge. Game mechanics not only create the virtual environment, but also allow for an interaction with it. This interaction ultimately creates a game’s gameplay. In this way, a computer game is based on strict rules that are executed and checked by the game. Depending on the design, these game rules can be quite complex, thus providing players with a broad variety of different interaction possibilities. As a result, new players of a particular game learn by exploration and observation. They try out different ideas and interactions with the virtual environments and learn from the feedback provided. For instance, when playing Minecraft, players might discover TNT blocks that explode and destroy a part of the environment when ignited. Being aware of this game mechanic might initiate a series of experiments to find out how capable TNT is and what can be done with it. By observing the results of the interactions, players learn the game’s rules. However, the desire to discover new knowledge might not end at this point, but initiate further research to determine the limits of the virtual environments. In the aforementioned example, this could mean to find out what happens if a huge number of TNT blocks explode at the same time. Similarly, when playing Astroneer, players are able to dig into the ground. Thus, some started an experiment to find out what happens when they reach the core of a planet. In general, testing for the limits of the virtual environments is a common goal, when only a fixed environment is provided. What happens when the end of the world is reached? What happens if previously determined limits are broken? Finding answers to those questions sometimes reveals funny glitches or even breaks the game. While this gameplay might not be intended by the game developers, it represents another form of enjoying a computer game. It satisfies the desire to explore the virtual environment and to learn all about its underlying principles. This insight can also be valuable for game designers as it indicates that providing a lot of different interaction possibilities and hidden secrets can increase a game’s overall entertaining aspects. In conclusion, exploring virtual environments not only is directed towards the environment itself but also towards its limits and all underlying principles. This week: This time, I think about computer game immersion and how it can dominate a player’s attention and awareness. Immersion in a computer game means that a player is completely absorbed by the gameplay and forgets about the surrounding environment as well as the fact that a game is played. The attention is completely directed towards the gameplay and the player feels as if they are part of the virtual environment or at least that they have full control over it. When immersed in a computer game, all virtual events feel real and can evoke deep emotions. These emotions are even carried over into the real world and combine the real life with the virtual life. However, the absorbtion rarely is total. Often, players are only partly immersed and split their attention between the real world and the virtual world. For instance, when two players play in multiplayer mode in front of the same screen using a gaming console, they continue to interact with each other or do have a conversation. The degree to which a player’s attention is directed towards the computer game depends on the player’s mental and physical involvement into the gameplay. This shared attention also allows for the creation of Let’s Play videos (LPs). These videos cover a player’s gameplay and are enhanced by the player’s commentary which provides a second story arch in parallel to the game’s narrative. Personally, I enjoy creating LPs as this is a completely different approach to playing computer games. It is not only about enjoying the narrative or the gameplay, but also about using games to create something new. Thus, creating LPs is a very creative process that provides an entertaining aspect in itself. Recently, I noticed the above-mentioned phenomenon of the shared attention and how it scales with the personal involvement of the player. Normally, I play Minecraft just as a background activity while discussing various things, such as spaceflight news, scientific results and personal experiences. However, as I discovered some new game mechanics that have been added to the game with the last content update, I noticed how my personal involvement and hence the immersion increased. While exploring and discovering the new game mechanics, my ability to discuss topics declined and I frequently got distracted while talking. Based on this subjective experience, I validated my own understanding of computer game immersion. 1) The degree of immersion quickly scales back up and down with the degree to which a player is involved in the gameplay. 2) A high degree of immersion dominates a player’s attention and immediately scales back other processes taking place outside of the virtual world, e.g., talking to other people. In conclusion, computer game immersion is a powerful experience that not only evokes deep emotions, but also dominates a player’s attention and awareness. Simultaneously, immersion directly scales up or down based on player’s personal involvement in the gameplay. This week: This time, I think about the need for natural input devices to enhance the immersive effects of virtual environments. Recently, I enjoyed playing X-Plane 11 in Virtual Reality (VR) mode. Being visually immersed in a detailed and accurate cockpit of an airplane was an unprecedented experience to me. It was one of the most realistic flight experiences in a simulation thus far. This week, we gave Assetto Corsa a try in VR mode. The experience was quite similar, as it allowed me to accurately steer the virtual racing cars by allowing me to look to the sides without any issues. Also, the natural perspective made it much easier to find the correct braking points. However, these two very positive VR experiences were affected by some overall comfort issues with the HTC Vive’s head-mounted display (HMD) as well as the control devices. The HMD is designed to almost completely reduce visual information from the real environment and to replace these information with computer generated ones. For this purpose, the HMD has to sit tight over a user’s eyes. While this might work well for people who do not need to wear glasses, it is a constant struggle for me. Frequently, my glasses get caught by the cushions as well as pressed on my nose. This works for short exposure times, but becomes quite uncomfortable when using the HMD over a longer period of time. This issue is even enhanced when using the Oculus which is even smaller. A more general issue comes from the control devices used. The controllers often feel like a combination of a TV remote and a gamepad. They of course allow for an interaction with the virtual environments in an efficient way, but also feel not very natural. Instead, their bulkiness often reduces my perception of the virtual environment and the feeling of being a part of it. Although others might disagree, this feeling is even enhanced when using gamepads. Here, every interaction feels highly artificial. Thus far, only highly specialized input devices like racing wheels provide a decent natural feeling. In conclusion, while I still see the importance of developing better devices for visualizing the simulations, improving the comfort and designing new input devices should be focussed first. By developing devices that provide a more natural feeling, e.g., gloves, the immersive effect of VR as well as desktop simulations could be improved.